Counting coup was a relatively harmless act of bravery and war honor of the highest grade. Any blow struck against the enemy counted as a coup, but the most prestigious acts included touching an enemy warrior, with the hand or with a coup stick.The term is of French origin from the noun coup (pronounced /ku/) which means a hit, a blow or a strike. The expression can be seen as referring to "counting strikes". 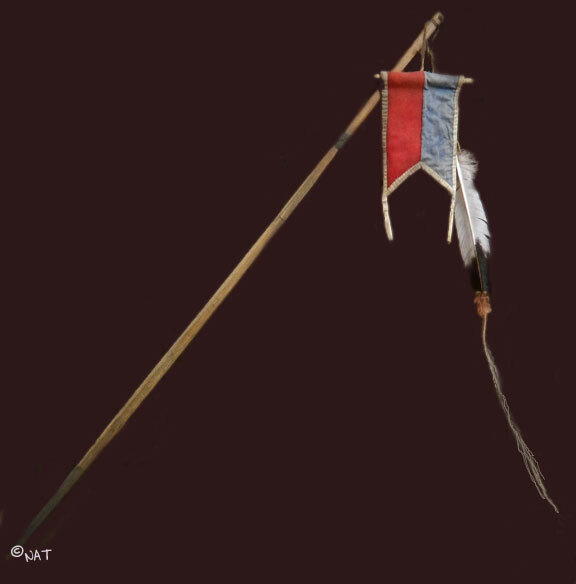 Coups were recorded by notches in the coup stick, or by feathers in the headdress of a warrior who was rewarded with them for an act of bravery. Measures approx. 50 inches long, human scalp locks, made from an MGM bow used in movies (50's -60'), raw hide cotton calico, hide glue, clay paints, etc. A beaded coup stick of this type of was widely used by many of the tribes of the Central and Northern Plains. This replica is Assiniboine dating from around 1870. The coup stick features size 11 seed beads - lots of them, a fold over beaded pendant (lazy stitched both sides) on deer skin, trade beads, feather and horse hair, etc.